The Mistral occasionally hosts a barbecue and entertaining Greek night with Greek music and professional dancers. The tradition of Greek music goes back thousands of years and is part of a national heritage treasured by the Greek people since this gift was entrusted to them by Apollo. The songs vent a dramatic expression to glorify joys, to wallow in sorrows and above all, to record inspirations, history and Greek legends and folklore. 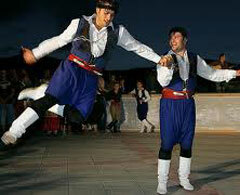 The lively Pedozalis dance involves lots of jumping and leaping and is indicative of the rugged mountain terrain of Greece. The raising of the legs and leaping in the air are expressions of a dancer leaping over the mountains. The smoother Syrtos is a flowing, dragging dance and is usually seen in the coastal regions of Greece and, of course, the islands. This dance characterises the more peaceful landscape and lyrical moods of the seashore.